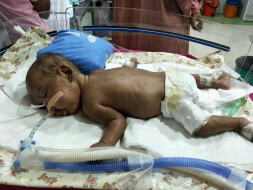 Please help this baby to see the world after one year from his birth. Mother had a Recurrent miscarriages and On 8th Nov 2016 they blessed with Twin Male baby’s in Chennai. Since Babies were delivered at 24.3 weeks consider as extreme preterm and admitted in NICU. The baby still requires respiratory support in the form of oxygen and is planned to be discharged on home oxygen support. Support ten months baby to go home for the first time. The parents need financial support to rent a home near by hospital and need a home care sister support and other medical expenses. Since baby is in hospital for more than 10 months chances of infections are high, They are shifting the baby for better development and bonding with the parents. For every contribution made to this fundraiser FROM October 26 until October 31, Milaap will add 25% of your donation. At present Baby is still on oxygen support and doctors have suggested to use bipap for 12hrs a day for the fast recovery. According to them, it may take another couple of months for the recovery. 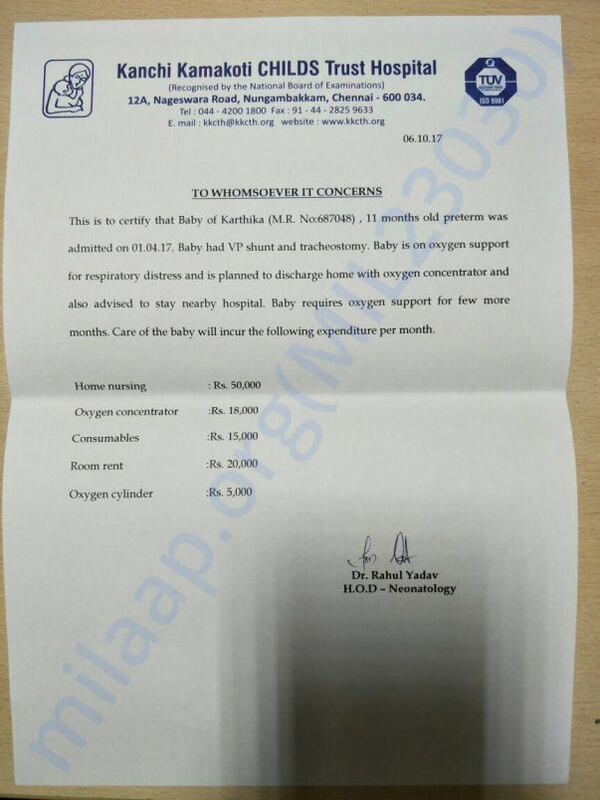 The baby of Karthika has been discharged and is at home now. He is under continuous care and is making improvements on a daily basis. He is still under artificial oxygen only and will be soon breathing normally all because of your prayers and blessings. Thanks to all the kind hearted. We are happy to inform you that Milaap is running a matching scheme on our campaign. For every contribution made to this fundraiser, Milaap will add 25% of your donation till 31st of October. Get well soon little and wish you see the world soon!